Revitalizing Hair & Scalp Tonic adds natural shine, volume and manageability to all hair conditions. Strengthens hair as it calms and balances an excessively dry or oily scalp. 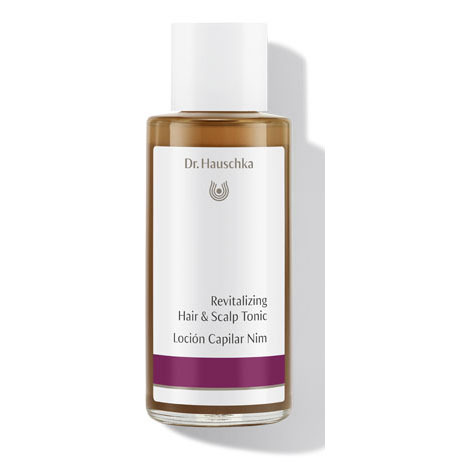 Formulation: Extracts of neem leaf, arnica and birch bark fortify fine hair and discourage breakage while nourishing and balancing an oily or dry scalp. Rosemary, borage and horse chestnut support and invigorate hair follicles. My scalp feels so much better after using this. As a mature person I have noticed changes on my scalp and this balanced it. Worked quickly too. Also seems like my hair is getting healthier looking. Still in observation but so far I like this scalp tonic : no irritation signs, nourishes scalp skin and hair, smells neutral herbal. Most important for me is that there are no ingredients that make fake, sugary hair volume. I recommend everyone to give themselves as scalp treatment at home. Leave it one for a day if you can. After you finally wash and dry your hair, you will then realize how unhealthy your scalp can get. Don't use very frequently but when I do I regret not using more often. Scalp feels wonderful, although I don't see a major difference in my hair. Haven’t mastered a technique of getting this to all of my scalp. Kind of laborious to apply. I often feel it’s making it to my hair not the scalp. That concerns me twofold: it's meant for the scalp for a reason I presume, also it’s got alcohol in it which I don’t want all over my hair. Willing to give it continued effort because generally Dr H products are so beneficial. I have very long chestnut hair and used freezer caps to retain the hair during chemotherapy. THIS wonderful product helped minimize the scalp damage from the freezing - a tiny touch of it even seems to be speeding up the return of my eyebrows now that chemo is over! LOVE this, it smells wonderful and feels gentle and soothing as well as nourishing to my scalp. I was surprised to find out the consistency is like water, I guess I was expecting something thicker. So I feel like it's hard to control the amount I use and it runs down my face. Also the alcohol content is kind of drying to my hair, which tends to be dry anyway. That said, it feels good on my irritated scalp. I have quite thin and fine straight hair. Over the years I have “plumped up” my hair using color, perms, various products. In later years, I’ve elected to stay away from harsh chemicals and just suffered along with flat hair. I took a gamble on this hair tonic. I have been very happy with face products from Dr. Hauschka. This tonic maintains my already shiny hair but seems to be nourishing my scalp as my hair appears and feels noticeably thicker after just a short time using it. I love it! Small amount goes a long way to repair and condition hair. I like the leave in feature. It does not make hair oily. This product makes my hair feel soft, and I love how fresh it smells. It's not sticky, and doesn't tangle my hair. I would highly recommend this to anyone who needs a hair pick-me-up. Light, clean, non-oily formulation. Easy to use. Has a strong herbal smell, which I like, but some may be turned off by it. This tonic is amazing, it makes my scalp and hair so well hydrated and it recovers my hair completely! Love the clean smell. Use it whenever I wash my hair. Doesn’t take a lot - I sprinkle on top of my head and spread over scalp with fingertips. Slowly filling in the sparse hair on top of head. I have tried some very expensive scalp tonics at my hairdresser's. I couldn't afford it. I found the Revitalizing Hair & scalp tonic and it has worked so well. My scalp is improving and my hair is so soft. I have only been using it a short while - the improvement is amazing. I'm sure in a few months I will have no scalp issues and my hair texture and shine will continue to improve. Thank you for this product!! This product is fantastic! My scalp gets dry in the winter and this tonic is perfect to soothe and balance. I have also noticed my hair growing in thicker. The smell is amazing! I had dry scalp from all-natural shampoos but also some breakouts on scalp. This tonic did the trick. I’d like to try the other one too to see how they compare. My scalp is all good now. With so many hair products out there, I was looking for a product that not only makes my hair shine, but one that is all natural and nurturing for my scalp as well. I use it about every other day to gently massage my scalp. This is one of my favorite Dr. Hauschka products! I have been using this for about two months only and every other day on average but I definitely noticed that my hair falls out much less and doesn't get as greasy so fast. The hair seems stronger also ! This was my first Dr. H. product - about thirty years past. I have lots of hair but the strands are thin. This tonic gives my hair volume and manageability and shine. Nice scent. I love it. This moistens my dry hair adds smoothness and shine. I use every other day, and this is part of my every day hair regimen. It make my scalp feel "oh so clean". I see great results with the hair tonic and hair treatment. My hair feels like young hair again. These are a couple of products that have stayed in the Hauschka line for years. My wish is that Hauschka would bring back their original shampoo and other original skin product. So far, I really like this tonic. I have fine hair and it actually thickens my hair. Like all Dr. H products, it smells pleasant. I have been using this hair "tonic" for about 2 years now. I was hoping Dr. Hauschka made a shampoo, but since they didn't seem to, decided to try this product, and I am so glad I did! I massage a tiny amount into my scalp/roots on a regular basis (almost daily) and it has made my long, fine extremely manage-able, healthy. and glowing. I would have never thought this type of product would make any noticeable difference, but now I can't live without it. As always, Hauschka makes real products that work wonders. Good product for hair/scalp care. It helps me with dandruff problem, by most likely altering my skin's pH. I use it regularly after washing my hair. It is a good product. Although I have used it for one week, I noticed that my hair becomes shine and smooth. Thank you so much. It really helped to slow down my hair loss due to dry winter air. This product is wonderful, works on clean scalp. The application is direct from a bottle, using a cotton. Just a suggestion had it been a spray bottle head it would have been much easier to apply. This tonic leaves my hair soft and so shiny. It makes my hair look bright and healthy. Well worth the price. As other reviewers indicated, this is a fantastic product for very dry, itchy scalp. I am not sure about shine and volume; I did not notice any difference. But I just wanted something to help my itchy scalp and this product does wonders for that. I had skin peeling all the time on my scalp, but since I started using this, I have a lot less of it. The scent is a bit strong and one that took a little bit of getting used to. The product is definitely pricey, and it's hard to find in stores, even those stores that stock Dr. Hauschka products. I just recently started using this product because my scalp is very dry and itchy. It didn't matter what shampoo I'd use, my head would still itch. I've even used prescribed medication from my dermatologist, but that never helped. I've been applying this tonic to my scalp once a day for the past week and the itching has completely stopped. I couldn't be happier! This is one of those amazing products where the herbs and plants shine through, like the Dr. H. Facial Toner. Excellent for use on all scalps-dry and oily-maintains balance, keeps hair clean longer, smells wonderful and heals scalp eczema! Massage into damp or dry scalp. Use regularly for strong, shiny hair, or apply daily to fortify fine hair. Part hair and distribute a small amount of tonic evenly over the scalp. Gently massage tonic into the scalp with fingertips. Do not rinse. Liquid may appear cloudy or particles may form due to the natural botanical ingredients. This does not affect quality or effectiveness. Can be applied before blow drying to protect against dryness and frizz. For fragile and damaged hair, we recommend Strengthening Hair Treatment.